Abstract imagery carries its own reality. I believe its language holds a meaning no less powerful than speech—that, in fact, it expresses of a deep part of the human psyche that cannot be accessed in words. A successful abstract painting is what it is what it is what it is. It invites you to connect with the part of your being that is not served by speech, and nourishes you there. I have looked deeply at pre-Renaissance western painting (Spanish manuscript painting, Romanesque and Byzantine frescoes), Tantric art, and Native American traditions—all of which relied either wholly or partially on abstraction to express their deepest beliefs about the relationship of humans to the cosmos. The commonality of their use of space and shapes holds truth for me and gives me a ground for my own work. I place myself as in the tradition of visual artists who have tried to give visible form to that which is not visible. The backgrounds in the series of paintings, From Blue and From Red, are made from multiple layers of clear gesso which has been saturated with acrylic paint. The resulting surfaces are matte and velvety. The shapes that emerge from these grounds are made with iridescent pigments, mostly pearlescent white. 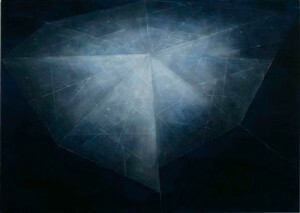 When seen in indirect light, the paintings shimmer and glow. I have summered the past few years in rural Colorado. The sight of insect cocoons and seed-pods breaking off their moorings to drift against the vast blue of the sky was probably the immediate source for the images in this work. In truth, though, these shapes have been at the edges of my mind for a long time. As a graduate student in sculpture, I made similar forms out of gauze, wire and wax. Though they are influenced by the structure of shells, chrysalises, webs, and jelly-fish, the shapes are invented amalgams. Their size is not firmly fixed in my mind; they could be tiny or enormous. Similarly, the space in which they float could be air, water, cosmic space or the interior of the body. Of two things I am certain, though: the forms are caught in the ephemeral moment between appearing and dissolving, and the space from which they emerge is infinitely deep. Visually, these paintings were inspired by Byzantine icons, early Renaissance Italian art, and medieval maps. Conceptually, they were born of my fascination with humanity’s need to create a narrative that explains our presence in this unexplainable universe. “Who are we? Where do we come from? Where are we going?” are questions that can never be fully answered, yet we fight to the death over our constructions. Human beings insist upon meaning, and the stories we’ve told ourselves are both dazzling and poignant. Having grown up in western culture and studied western art, I am most familiar with stories from the Christian tradition. Angels have been particularly interesting to me, both visually and conceptually, and this work was made with the idea of angels in the back of my mind. Beautiful, powerful messengers, intermediaries between Heaven and Earth —human beings with wings: what a lovely, odd idea. Gabriel, the Annunciating Angel, is the most often depicted, and I have always found the story of the Annunciation resonant. A description of matter being charged by spirit, it speaks beautifully of our desire to unify our dual nature and of our longing to be touched by the divine. On a formal level, the paintings in this series borrow their complete separation of figure and ground from traditional Byzantine icons. They derive their forms from abstractions of wings—bird, bat and butterfly—and from medieval navigational and celestial maps. My initial interest in old maps was a visual one: I enjoyed their often irregular edges, their chart-lines and their ornamentation. Later, I began to realize that like Creation stories —and art itself —-pre-modern maps imposed a structure on the unknown. What was not yet explored was imaginatively depicted, for to the makers of those maps, to simply not-know was unacceptable. 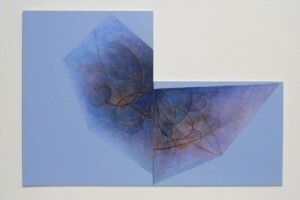 The diptych structure of this work obviously derives from the idea of two wings, but the inequality of the halves and their misalignment allude to the continuing imperfection of our knowledge. We see things askew, our answers don’t add up, our efforts to improve the world often make things worse. And in these times, just whose God is or isn’t talking to us? Human beings without wings: what a funny scary idea. As someone who was for years a sculptor, I’ve always been attracted by the actual physicality of a painting—the fact that it is an object existing in space, as well a world to be entered. By using a non-rectilinear format for these pieces, I hope to emphasize their dual existence as illusion and object. I began this series by folding rice paper into the shape I wanted and then painting it. As the series progressed, I started to open out and re-fold the paper after painting it, finding the composition through accident and improvisation. I spend a lot of time looking at images of icons, illuminated manuscripts, and medieval and Roman frescoes. One of the things that fascinates me about this work is the way time can erode away parts of it, marooning an image or a scrap of narrative. I like the mystery of having just a piece of something — something that is separated from its context, yet still potent with a latent meaning. 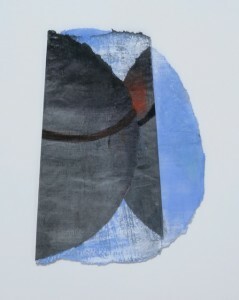 In my imagination, these paintings on paper start out as fragments of something not quite identifiable. As I work, each gradually achieves its own individual reality. I painted much of this series in rural Colorado looking out at the Sangre de Cristo mountains, and at some point I realized that I could reference landscape in this work. A fold could suggest a cliff edge or an horizon line, for instance. It was enjoyable to evoke the vastness of landscape in these small pieces, and working outside the rectangle liberated me from the constraints of traditional landscape painting.